Post Ferguson, pre-election: Let us discuss Race and the Vote in the Pacific Northwest. One bright Farmer's market Saturday morning two weeks ago, when downtown Bellingham seemed almost unbelievably hip, sunny, and organic all in the same breath, I stopped to chat with a group supporting farm worker rights in WA. They talked about their struggles to form a union, receive adequate housing on local farms. I asked how many farms are unionized in Washington State? Only one other at this time, was the answer. However, Latino and Hispanic peoples have a long history in WA. We are full of talk about community in Bellingham, WA. Most of the time the community concerns are those of a white community. Racial divides are often not what people think of first when contemplating Washington State. Our endless rain and Microsoft's endless success assure that when most of the nation thinks about us, it isn't in terms of racial conflict. Historically, if wasn't too long after Lewis and Clark had returned from their expedition to the Northwest that the nation was busy crafting the Missouri Compromise. During the civil war era, Washington was a remote outpost, not achieving statehood until 1889. For all municipal purposes, Washington remained for a long time a bastion for escapees, Utopians and frontiersman. For the devotees of a "White Homeland", eastern Washington still holds this type of promise. It comes as a shock to a native of Oakland, Ca to see such separatist web sites.. But then advertisements on the local bus system in Oakland while I was growing up promoted the possibility of a separate homeland for African-Americans created from the Southern states. I don't expect the concept of either black or white separatism will ever find much acceptance. 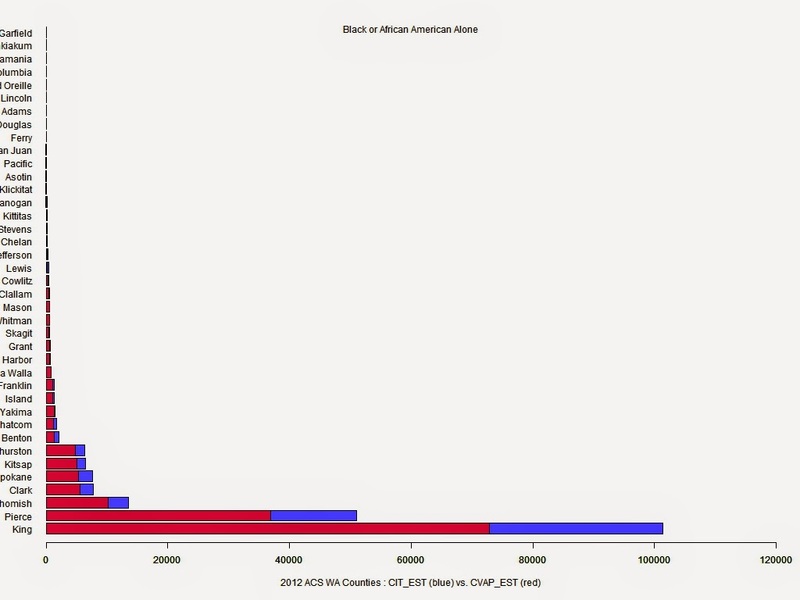 I have divided the racial composition of this chart into red and blue parts because I think the red categories show something inevitable and historic about the ephemeral distinction we call race. In a global world of more than seven billion people, skin color and ancestry are antecedents to a very big and active mixing pot. The concept of race and racial identity, is curious for many of us in America who have traced our so called "European" ancestry. For long native West Coast Americans like myself, our ancestors have been emigrating to America and creating post European, post old World hybrids for generations out of a potpourri of races and ethnic backgrounds. If anything symbolizes America, it is the hybrid vigor of our 'melting pot'. I can trace as far back to the early 1500s, my first New World ancestor. He was an 'Escobar' famous for writing a historical passage that described Hector Cortez' escape across the mountains whilst being chased by the Aztecs who were attempting to retrieve their stolen gold. Centuries later, my Castillian progenitors were very 'mestizo' in appearance including one Marcelino Escobar, a land grant holder and reputedly the first mayor of Monterey, CA. Still proud of her Castillian heritage more than 250 years later, my Irish/Castillian grandmother would regale me with stories of 'Cita' and 'Mama Cita' and my other 'Castillian' ancestry. But in truth, 'mestizo' would have probably remained my skin color had not those same progenitors intermarried Irish, Portuguese, English, Polish, Italian, and Dutch immigrants in Oakland, California at the turn of the 20th century and post WWII. In tracing my ancestry, I have concluded that it is so extensively heterogeneous that laying claim to any specific trait (except for maybe 'hybrid vigor' :-)) would be foolish. I think for many of us whose ancestors have been here for generations, the concept of race or ethnicity is the last thing we would want to define us. For some of us living in the "anthropocene" era of seven billion peoples whose nation states seem continually in political conflict over dwindling resources, the concept of race should be seen as a cosmetic externality ; a phenotypic "feature" of our species in a complicated, global economy where we all have much more exigent worries on this small planet called Earth. But this is not the case in today's world. The concept of race is still politically bound to culture, natural resources, religion, geopolitics, economic stature, educational levels, family resources, health and quite a few other important components of prosperity, happiness, and well-being. For example, it is relatively chilling to hear the United States attorney general Eric Holder describe his own personal profiling experiences with police linked to his race. Indeed, the conflict in Ferguson reminds me so much of our overseas conflicts I wonder if we are simply not importing a fundamentally racist war on terror to the homeland. Is there a uniform vote from 'people of color' in an imperialist, militarist America? That's hard to know, but in an economy where the rich are increasingly richer and whiter and the poor are not such, the possibility of racial conflict looms for many towns both big and small. A shrinking American dream in an increasingly competitive global economy is apparently no safe place for a "melting pot". 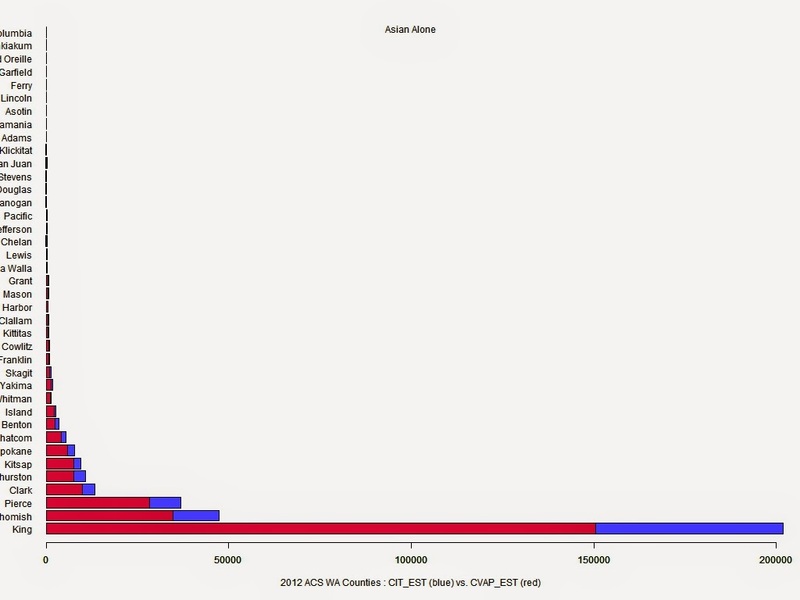 [14,] "Grays Harbor County, Washington"
[26,] "Pend Oreille County, Washington"
[28,] "San Juan County, Washington"
[36,] "Walla Walla County, Washington"
This first chart below gives us the Citizen and CVAP ACS data from 2012. Notice that there are many smaller counties in Washington. The visual representation here gives us the concept that the larger the county, the larger the gap between the number of citizens and the number of citizens that are not of voting age. 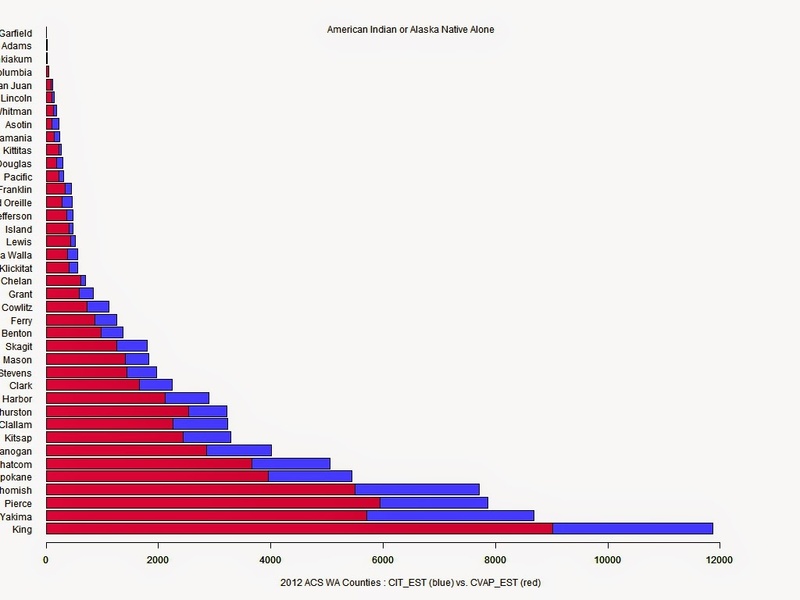 This most probably indicates that the most populous counties not only have the most children nominally (under age 18), but the largest percentage of children per citizenry. This is chart below for the Census category "White Alone". This is by far the largest 'racial' category in Washington. 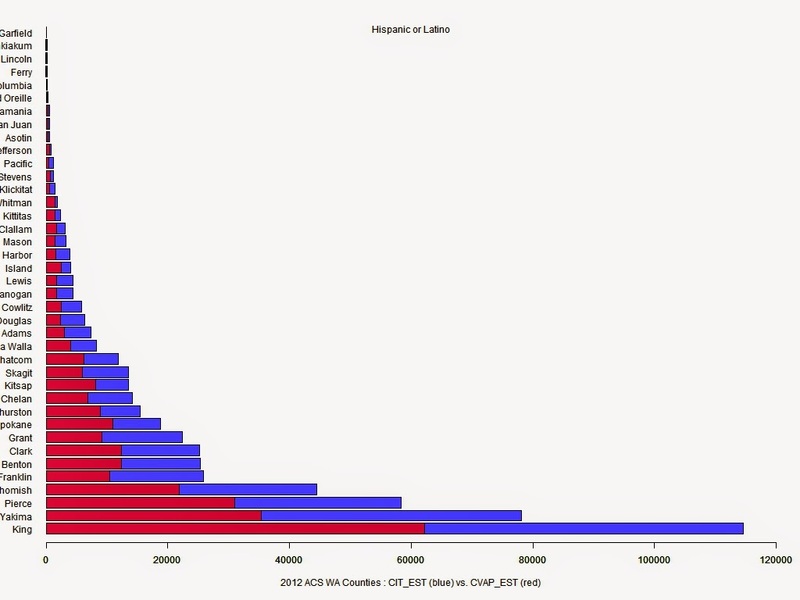 The chart below gives us Hispanic or Latino populations. This population, from a visual perspective, has the largest gap between the number of citizenry and the number of voting age citizenry. I find this gap so different visually than the other races that I am perplexed. Logically, it would mean that Hispanics have a much younger population than other races. But the results are so consistent across counties, I would like to investigate further. Keep in mind, these are citizens; not visa holders or undocumented workers. To my mind, the racial group 'Asian' is not very specific. What useful can come of a category that lumps in Korean, Japanese, Chinese, Indian, Vienamese, Laotion, Phillipino, etc into one category? Nonetheless, whatever the Asian category specifies, it is very dominant in King County. 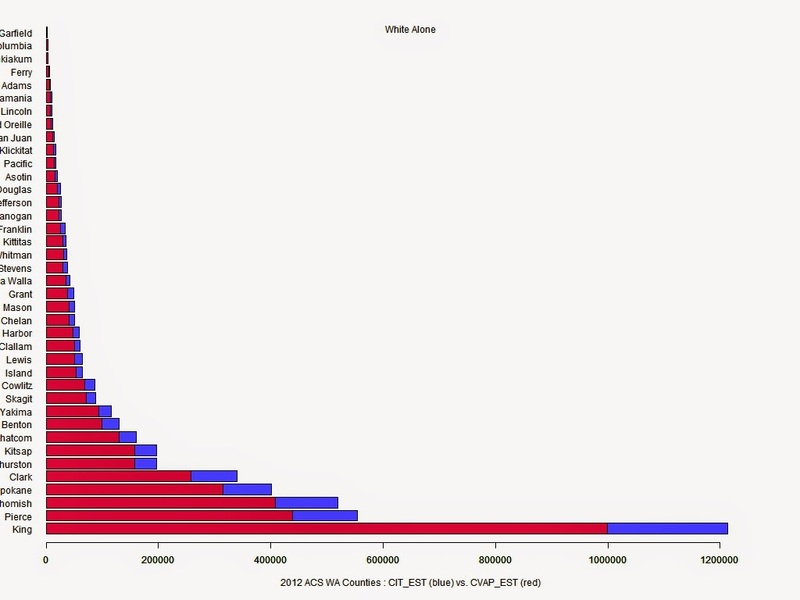 The dominance of King and Pierce counties for the census category "Black or African American Alone" is clear in this graph. Clearly, most of the small counties of Washington do not have extensive Asian or Black populations. Native American population are clearly much smaller than either Hispanic, Asian, Black populations in WA state. 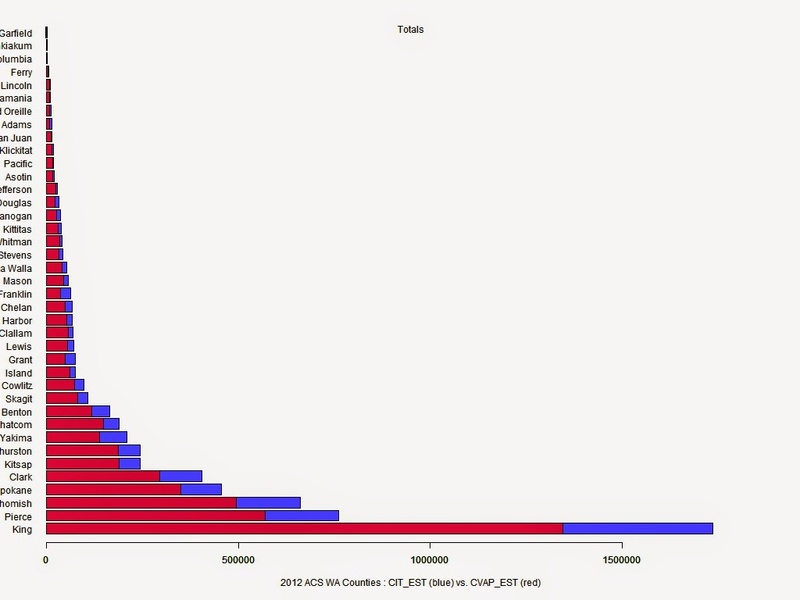 But the Native American populations are also spread more evenly across the various counties they live in. A small population with a more even distribution (and linked leadership) could, in theory, present an important asset to any party that wants to capture that vote in WA.